Amputation, is the removal of part or all of a body part enclosed by skin. Within the context of Islam, it refers to the removal of the hands or feet. This, along with beheading, flogging, stoning, and crucifixion, is a prescribed punishment in Islamic law. I use a special sharp knife, not a sword. When I cut off a hand I cut it from the joint. If it is a leg the authorities specify where it is to be taken off, so I follow that. Amputation is used as punishment for theft in Nigeria, which reintroduced shariah law in 1999. This, along with other shari'ah punishments, are "overwhelmingly" supported by the Nigerian Muslim population, and by 2003 three men already had their arms amputated for stealing; a goat, a cow, and two bicycles. In Somalia, one man found guilty of stealing was put on public display as his hand was severed at the wrist and then dangled by the index finger. In June of the same year (2009), a court run by an Islamic group sentenced four Somali men to each have a hand and a leg cut off for allegedly stealing mobile phones and guns. In 2008, the Islamic Republic of Iran saw five double amputations in a single week--five convicted robbers were each sentenced to have their right hands and left feet amputated. The hardline Taliban Friday publicly executed a murderer and amputated limbs of two robbers amid shouts of "God is the Greatest" at the Kabul stadium, witnesses said. Thousands of Taliban soldiers and citizens, including women, watched the proceedings. The murderer squatted and after his face was covered with a pink mask he was shot dead by the father of the man allegedly killed by the accused earlier this year. Later a team of surgeons wearing blue masks chopped off right hands and left feet of two men convicted of highway robbery. The surgeons amputated the limbs after anaesthetizing the convicts and left the severed limbs on the ground for the spectators to rush and have a close look. The three were convicted by a military tribunal created by the Taliban supreme leader Mulla Omar to deal with criminal cases under the Islamic Sharia law. Taliban, who now control almost three-quarter of Afghanistan, have enforced punishments in public under the Islamic law which they say helped deter and curb criminal acts. As to the thief, Male or female, cut off his or her hands: a punishment by way of example, from Allah, for their crime: and Allah is Exalted in power. While the majority of Muslim translators have remained true to the Arabic text, many apologists have attempted to obscure the plain meaning of Quran 5:38. However, the hadith prove its meaning is entirely literal. Furthermore, Muhammad and the early generations of Muslims had no qualms with it being so. Narrated 'Aisha: The Prophet said, "The hand should be cut off for stealing something that is worth a quarter of a Dinar or more." Narrated 'Aisha: The hand of a thief was not cut off during the lifetime of the Prophet except for stealing something equal to a shield in value. Narrated Ibn 'Umar: Allah's Apostle cut off the hand of a thief for stealing a shield that was worth three Dirhams. Narrated Abu Huraira: Allah 's Apostle said, "Allah curses the thief who steals an egg (or a helmet) for which his hand is to be cut off, or steals a rope, for which his hand is to be cut off." Plundering is not considered to be thievery. Narrated Jabir ibn Abdullah: The Prophet (peace_be_upon_him) said: Cutting of hand is not to be inflicted on one who plunders, but he who plunders conspicuously does not belong to us. Able-bodied men are needed during times of war, so hands are not to be cut off during an expedition. Narrated Busr ibn Artat: Junadah ibn AbuUmayyah said: We were with Busr ibn Artat on the sea (on an expedition). A thief called Misdar who had stolen a bukhti she-camel was brought. He said: I heard the Apostle of Allah (peace_be_upon_him) say: Hands are not to be cut off during a warlike expedition. Had it not been so, I would have cut it off. Amputation not needed for thieves who steal fruit. Narrated Rafi' ibn Khadij: Muhammad ibn Yahya ibn Hibban said: A slave stole a plant of a palm-tree from the orchard of a man and planted it in the orchard of his master. The owner of the plant went out in search of the plant and he found it. He solicited help against the slave from Marwan ibn al-Hakam who was the Governor of Medina at that time. Marwan confined the slave and intended to cut off his hand. The slave's master went to Rafi' ibn Khadij and asked him about it. He told him that he had heard the Apostle of Allah (peace_be_upon_him) say: The hand is not to be cut off for taking fruit or the pith of the palm-tree. The man then said: Marwan has seized my slave and wants to cut off his hand. I wish you to go with me to him and tell him that which you have heard from the Apostle of Allah (peace_be_upon_him). So Rafi' ibn Khadij went with him and came to Marwan ibn al-Hakam. Rafi' said to him: I heard the Apostle of Allah (peace_be_upon_him) say: The hand is not to be cut off for taking fruit or the pith of the palm-tree. So Marwan gave orders to release the slave and then he was released. Narrated 'Aisha: The Quraish people became very worried about the Makhzumiya lady who had committed theft. They said, "Nobody can speak (in favor of the lady) to Allah's Apostle and nobody dares do that except Usama who is the favorite of Allah's Apostle. " When Usama spoke to Allah's Apostle about that matter, Allah's Apostle said, "Do you intercede (with me) to violate one of the legal punishment of Allah?" Then he got up and addressed the people, saying, "O people! The nations before you went astray because if a noble person committed theft, they used to leave him, but if a weak person among them committed theft, they used to inflict the legal punishment on him. By Allah, if Fatima, the daughter of Muhammad committed theft, Muhammad will cut off her hand!" He (the Holy Prophet) then commanded about that woman who had committed theft, and her hand was cut off. 'A'isha (further) said: Hers was a good respentance, and she later on married and used to come to me after that, and I conveyed her needs (and problems) to Allah's Messenger (may peace be upon him). Narrated Jabir ibn Abdullah: A thief was brought to the Prophet (peace_be_upon_him). He said: Kill him. The people said: He has committed theft, Apostle of Allah! Then he said: Cut off his hand. So his (right) hand was cut off. He was brought a second time and he said: Kill him. The people said: He has committed theft, Apostle of Allah! Then he said: Cut off his foot. So his (left) foot was cut off. He was brought a third time and he said: Kill him. The people said: He has committed theft, Apostle of Allah! So he said: Cut off his hand. (So his (left) hand was cut off.) He was brought a fourth time and he said: Kill him. The people said: He has committed theft, Apostle of Allah! So he said: Cut off his foot. So his (right) foot was cut off. He was brought a fifth time and he said: Kill him. Yahya related to me from Malik from Abdullah ibn Abi Bakr ibn Hazim that Amra bint Abd ar-Rahman said, "A'isha, the wife of the Prophet, may Allah bless him and grant him peace, went out to Makka and she had two girl mawlas of hers and a slave belonging to the sons of Abdullah ibn Abi Bakr as-Siddiq . She sent a figured cloak with the two mawlas which was sewn up in a piece of green cloth." Amra continued, "The slave took it and unstitched it and took out the cloak. In its place, he put some felt or skin and sewed it up again. When the mawla girls came to Madina, they gave it to his people. When they opened it, they found felt in it and did not find the cloak. They spoke to the two women and they spoke to A'isha, the wife of the Prophet, may Allah bless him and grant him peace, or they wrote to her and suspected the slave. The slave was asked about it and confessed. A'isha, the wife of the Prophet, may Allah bless him and grant him peace, gave the order and his hand was cut off. A'isha said, 'A thief's hand is cut off for a quarter of a dinar and upwards.'" Malik said, "The limit I prefer above which cutting off the hand is obliged is three dirhams, whether the exchange is high or low. That is because the Messenger of Allah, may Allah bless him and grant him peace, cut off the hand of a thief for a shield whose value was three dirhams, and Uthman ibn Affan cut off the hand of a thief for a citron which was estimated at three dirhams. This is what I prefer of what I have heard on the matter." 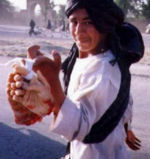 Narrated Fadalah ibn Ubayd: A thief was brought to the Apostle of Allah (peace_be_upon_him) and his hand was cut off. Thereafter he commanded for it, and it was hung on his neck. Narrated AbuUmayyah al-Makhzumi: A thief who had accepted (having committed theft) was brought to the Prophet (peace_be_upon_him), but no good were found with him. The Apostle of Allah (peace_be_upon_him), said to him: I do not think you have stolen. He said: Yes, I have. He repeated it twice or thrice. So he gave orders. His hand was cut off and he was then brought to him. He said: Ask Allah's pardon and turn to Him in repentance. He said: I ask Allah's pardon and turn to Him in repentance. He (the Prophet) then said: O Allah, accept his repentance. Narrated Abdullah ibn Umar: The Prophet (peace_be_upon_him) had a man's hand cut off who had stolen from the place reserved for women a shield whose price was three dirhams. Narrated Abdullah ibn Amr ibn al-'As: The Apostle of Allah (peace_be_upon_him) was asked about fruit which was bung up and said: If a needy person takes some with his mouth and does not take a supply away in his garment, there is nothing on him, but he who carries any of it is to be fined twice the value and punished, and he who steals any of it after it has been put in the place where dates are dried to have his hand cut off if their value reaches the value of a shield. If he steals a thing less in value than it, he is to be find twice the value and punished. Yahya related to me from Malik from Abdullah ibn Abd ar-Rahman abu Husayn al-Makki that the Messenger of Allah, may Allah bless him and grant him peace, said, "The hand is not cut off for fruit hanging on the tree and for sheep kept in the mountains. So when they are taken from the fold or the place where the fruit is dried, a hand is cut off for whatever reaches the price of a shield." Yahya related to me from Malik from Abdullah ibn Abi Bakr from his father from Amra bint Abd ar-Rahman that a thief stole a citron in the time of Uthman Uthman ibn Affan ordered its value to be estimated and it was estimated at three dirhams at the rate of exchange of twelve dirhams for the dinar, so Uthman cut off his hand. "...when a thief steals goods, only their price on the day he stole them is looked at. If cutting off the hand is necessary because of it, that is done. If the cutting off is delayed, either because the thief is imprisoned until his situation is examined or he flees and then is caught, the delay of the cutting off of the hand does not make the hadd, which was obliged for him on the day he stole, fall from him even if those goods become cheap after that. Nor does delay oblige cutting off the hand if it was not obliged on the day he took those goods, even if they become expensive after that." Allah commands and decrees that the hand of the thief, male or female be cut off. During the time of Jahiliyyah, this was also the punishment for the thief, and Islam upheld this punishment. In Islam, there are several conditions that must be met before this punishment is carried out, as we will come to know, Allah willing. There are other rulings that Islam upheld after modifying these rulings, such as that of blood money for example. Is the repentance of a thief acceptable? (Those who were before you were destroyed because when an honorable person among them would steal, they would leave him. But, when a weak man among them stole, they implemented the prescribed punishment against him. By Him in Whose Hand is my soul! If Fatimah the daughter of Muhammad stole, I will have her hand cut off.) The Prophet commanded that the hand of the woman who stole be cut off, and it was cut off. Where should amputated limbs be buried? This matter is open, because amputated limbs do not come under the same ruling as the whole person. There is no reason why they should not be put with the garbage, but burying them in the ground out of respect towards them is preferable. But the matter is open, praise be to Allaah, as we said. They do not have to be washed (ghusl) and buried unless it is a foetus of more than four months’ gestation. But if it was merely flesh into which the soul had not yet been breathed, or it was an amputated finger or something similar, then the matter is open. But burying it in the ground is good and is preferable. Can a thief have his hand surgically reattached? Sharia Law And Forced Amputations In Nigeria: "This is What God Said"